I live in the State of Georgia which is known as the Peach State. When we first moved to Atlanta I couldn't believe how many streets were named "Peachtree". I come to find out that there are at least 71 streets in Atlanta that are named "Peachtree", which can be confusing. Anyways, Georgians like peaches and one dessert I like to make with fresh peaches is these icy cold Frozen Peach Pops. This is actually a peach sorbet on a stick. They are just to thing to enjoy on a hot and humid summer's day. And we have plenty of those in Georgia. It's interesting that the frozen fruit pop was invented by accident. The story goes that Frank Epperson had made a glass of lemonade and, by chance, left the glass, with a spoon in it, on his windowsill overnight. It was a cold night, and next morning he discovered that the lemonade was frozen. To remove the frozen lemonade from the glass, he held on to the spoon and ran the glass under hot water. Looking at the frozen block of lemonade he decided he had invented something new. So he got a patent on what he called an "Epsicle" which he eventually sold to the Joe Lowe Corporation who renamed the frozen fruit on a stick the "Popsicle". 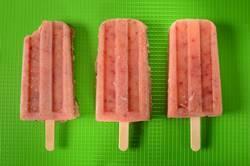 These Frozen Peach Pops are so easy to make. Just make a sugar syrup and stir it into pureed peaches, along with some Prosecco. I like to add a little Prosecco (Sparkling Wine) for several reasons. First, the alcohol prevents the peach sorbet from freezing too solid. Secondly, the bubbles lighten the texture of the sorbet. And lastly, it adds a lot of flavor. If you don't want to add Prosecco you could use a Sparkling Water or even a fruit juice (lemonade, orange juice, apple juice, etc.). Also, if you want to just make a Peach Sorbet, instead of placing the mixture in popsicle molds, just chill the mixture and then churn in your ice cream machine. Frozen Peach Pops: Place the sugar and water in a small saucepan and bring to a boil. Let the mixture boil for about one minute or until the sugar dissolves. Remove from heat and let cool to room temperature. The sugar syrup can be made, covered, and stored in the refrigerator for a couple of weeks. Next, wash and cut the peaches into large chunks. Place in the bowl of your food processor or blender and process until they are pureed. Add the sugar syrup and Prosecco and pulse to combine. Pour the mixture into your popsicle molds (Available on Amazon) and freeze for about 6-8 hours (or overnight) or until frozen.